The first of the Chase family to be laid to rest in the tomb was Mrs. Thomasina Goddard in the year 1807. 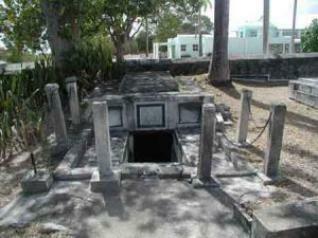 In a West Indies cemetery stands the vault of the Chase family and it would seem that up until the patriarch, Thomas Chase, died it had been the peaceful resting place for the members of the family that had passed on prior to his demise. Thomas Chase, it seems, was one of the most hated men on the island. One can only assume he was an intensely unpleasant person, even towards his family. When the time came to put Mr. Chase into his final resting place in or about the year 1813 or 1814, and the ground keepers opened the door to the crypt, all the coffins had moved from their original positions. This bizarre occurrence continued to happen for some years. Many of the local people reported actually hearing the coffins moving around inside the completely sealed tomb. The first of the Chase family to be laid to rest in the tomb was Mrs. Thomasina Goddard in the year 1807. In the very next year two year old Mary Ann Chase was laid to rest in 1808. Then another child, Dorcas Chase, was also put into the vault in 1812. Everything was peaceful and without incident until Thomas Chase was to be placed inside. When the crypt was opened to place his mortal remains inside, the other coffins had moved themselves from their places. The funeral party was quite angry to find the coffins in disarray and, at first, thought grave robbers to be responsible for the disrespectful act. However, the group soon abandoned this train of thought as nothing was missing from the coffins, nor had anything of value been put in the coffins to begin with. Most importantly, the door to the burial site was a huge stone that had been cemented into place and the seal had not been broken since the last burial. In order to open it, the seal on the huge slab of stone had to be broken with hammers and chisels. The stone was so big that it took at least four men to move it. Unsettled and unnerved, the townspeople placed the body of Thomas Chase inside and resealed the vault. Thomas' coffin was a 240 lb. lead coffin, so everyone figured that it was a pretty near impossible feat to drag the extremely heavy coffin around until it busted open and spilled anything of value out onto the floor. In 1816 eleven year old Charles Brewster Ames died and once again it was time to open the tomb. When the tomb was opened the coffins had once again moved from their proper places. The lead coffin of Thomas Chase looked as though it had been tossed around like a rag doll. The crypt, once again, had still been completely sealed and, again, it bore no signs of tampering or forced entry. Just 52 days later, another member of the family Chase was needing burial in the crypt. As expected, a rather large crowd had gathered for this particular funeral, and they weren't disappointed. Once again the cement-sealed door was closely examined before being opening, and once again there were no signs of forced entry or tampering. Again the coffins had been thrown about. The only difference this time was that the first coffin, the coffin of Mrs. Goddard, also the only one made of wood - had been badly damaged. A minister was called in to view the scene, but he could give no new insight into the disturbances. Once again the vault was sealed. In 1819 another family member required burial. Once again the now infamous vault was opened with all the same results - except this time the wooden coffin found damaged the last time the crypt was opened had not been moved even a centimeter. The governor of the island had had enough of these mysterious, disturbing events and ordered his own investigation. Of course, nothing was found. This time the governor had sand scattered on the floor of the crypt to catch the footprints and movements of anyone who may have gained entry. The governor put his own seal on the tomb in the wet cement, then the vault was ordered sealed until another of the family Chase needed interment. But the governor did not wait that long. Less than a year later he ordered the crypt opened in front of himself and several other friends and heads of government. The seal was, of course, completely intact upon inspection, but the coffins were still scattered. Some of them had even been turned upside down and standing on their "heads", and the heaviest of the lot was found lying halfway up the steps leading to the door. The sand showed no footprints or any sign of water leakage. The governor ordered the coffins to be moved to a new burial site, and the crypt was left empty and open. It remains empty to this very day. Do Ghosts Only Haunt Houses?